If you have a 2010 to 2013 model year Cadillac CTS with the 3.0 Direct Injection V6, verified by the 8th digit of your VIN being an "E" in 2010, "Y" in 11 and a "5" in 2012-13, you're on the right page for your vehicle! E85/Flex Fuel - Get our E85 Flex Fuel retrofit kit if you have access to E85 in your area. Running the Overkill E85 tune over Overkill 93 octane tune is worth a dyno tested 16 wheel horsepower improvement. It's an easy installation and you can run gasoline or ethanol or any mixture of once installed and tuned. Overkill 80mm Throttle Body and JacFab Ported Intake Manifold - These go hand in hand together. The Overkill 80mm replaces the little 72mm factory throttle body. The ported manifold, designed for 2012+ 3.6 but fits the 3.0, opens up the manifold inlet to 80mm and fills in a turbulent entrance cavity to improve flow. Together they add up to 20 wheel horsepower. Now is when you should look to upgrade the size of your intake tubing as well, the factory tube won't fit the 80mm opening. High Stall Torque Converter - This mod is ambiguous on where it fits on the modpath. If you want to drop nearly a full second from your 0-60mph time and launch hard from a standstill, a high stall torque converter is one of the best mods for the 3.0 DI, which is a high rpm motor. It's a significant install but worthwhile. Overkill tuning is recommended before doing the torque converter. More minor mods - Exhaust work is small gains on the 3.0, you can install the mufflers you like and gain more sound than horsepower, and there's also the JacFab intake manifold spacer for the 2012+ 3.6 that works on the 3.0, which improves midrange torque and is worth considering if you mainly accelerate in the 3000-4000rpm range. Overkill is proud to be a specialist of the GM Direct Injection V6 family and the little brother 3.0 V6 has not been forgotten. These engines are quite detuned from factory and power gains from tuning can meet and even exceed the larger 3.6. With Overkill tuning, you'll also notice much improved throttle responsiveness and improved transmission performance which will feel lighter and easier to drive. Improved response from the throttle pedal, NO NEED FOR EXTERNAL THROTTLE BOOSTERS! 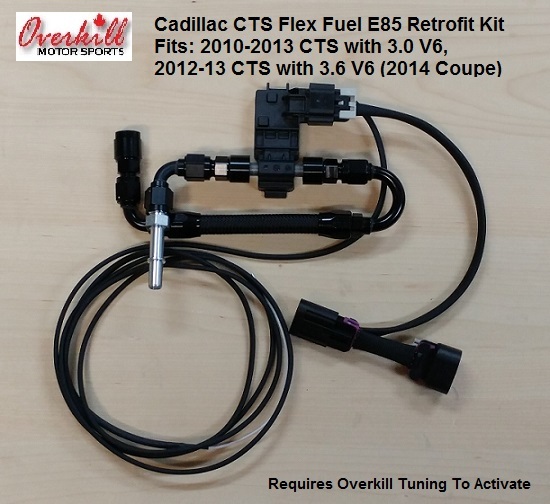 Tuning for Our Flex Fuel Conversion Kit to use E85 or Gasoline as you desire! Why get an Overkill tune versus the competition? Specialized in the GM Direct Injection V6 motors. From revised cam phasing, fully reconstructing spark timing tables and fully revised throttle calibration, an Overkill tune is more comprehensive than what you'll get at your local dyno shop, or a do-all tuning provider. Support for your mods. Not only are we the only company with an E85 Flex Fuel conversion kit or a larger 80mm throttle body kit, but we also have the right tuning to ensure you get the most from them! Autocal Handheld: The best way for us to provide CTS 3.0 tuning for you is through our Autocal handheld system. The Autocal handheld allows you to take the handheld to the vehicle, read the factory file, upload our Overkill tunes and provide scan data, with no laptop required. Return to stock calibration whenever you want, apply updates and retunes easily through email with us and Overkill retuning is available at no charge for as long as you own your CTS. Want a great deal? Of course you do! This combo pairs Overkill Tuning through our Autocal handheld with our E85 Flex Fuel kit. You'll get Overkill tuning for 87 and 91/93 octane gasoline, plus tuning for E85 Ethanol fuel which out performs its gasoline counterparts. The flex fuel kit retrofits a GM flex fuel sensor into the fuel system, and relays a precise ethanol content of the fuel in the system to the computer. In combination with Overkill tuning, the computer will adjust air/fuel targets for any ethanol blend. You can switch between gasoline and E85 ethanol as desired without requiring any changes to the vehicle once this kit and Overkill tuning is installed. This is by far the best bang for your performance buck on a 3.6 LFX V6! 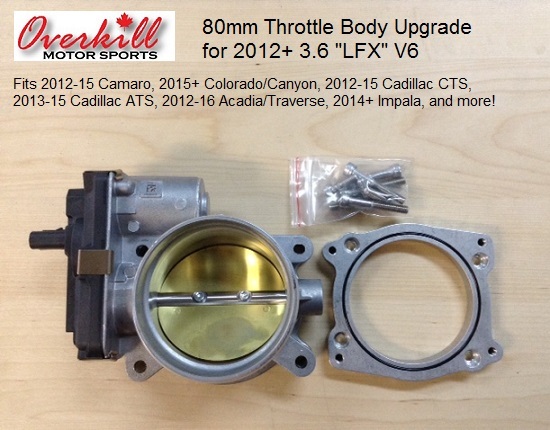 Overkill pioneered larger throttle body solutions on the Direct Injection V6. For your 3.0, we have two different options, depending on the year of your vehicle. In both cases, your factory throttle body is around 72mm, and chokes your intake manifold's flow capabilities. With your 2010-2011 CTS, we offer a 76.5mm upgrade. It looks very similar to your factory throttle body, just a larger version. With your 2012-13 CTS, we offer an 80mm upgrade, which uses an adapter plate to bolt on its different bolt pattern. In both cases, you'll see improved throttle response, deeper engine note at full throttle and overall improved acceleration. Requires no tuning in either case, works fine with a stock manifold and even better with a ported intake manifold from our friends at JacFab. Both throttle body solutions use a brand new throttle body and requires no core charge on your old throttle body.